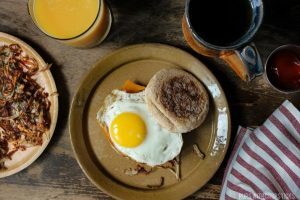 When it comes to breakfast, I am one of those people that almost always skip it. 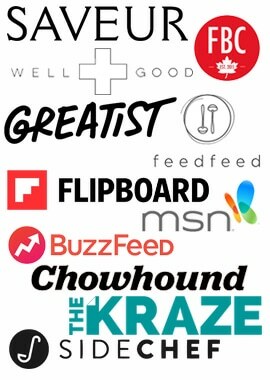 Partially because I’m not usually hungry in the morning – due to that wonderful appetite suppressant called coffee but mostly because I don’t function well in the morning (in the kitchen) from my zombie state. But who said breakfast sandwiches need to be for breakfast? Why not have it for Brinner (Breakfast for Dinner)? 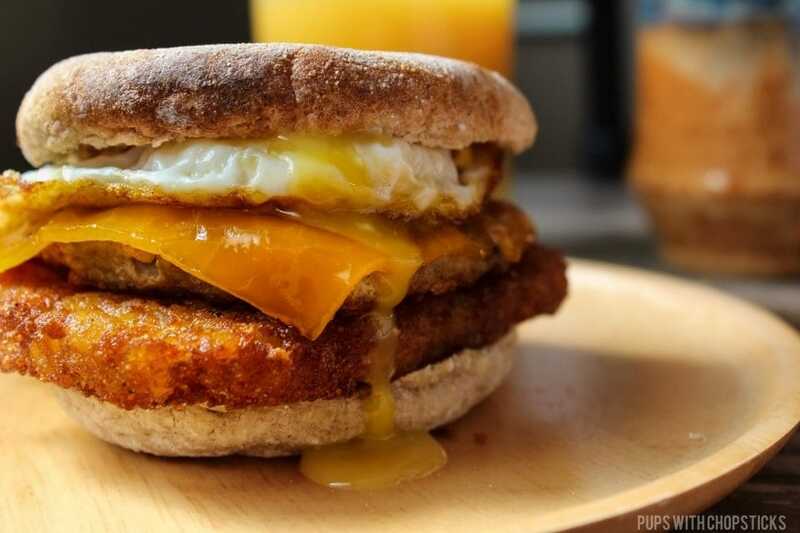 This breakfast sandwich is inspired from McDonalds breakfasts. Yep McDonalds. It’s a guilty pleasure of mine which gives me fond memories of road trips as a kid with mom and dad. Whenever we were going to head somewhere far, I always got excited because that meant I got to have a McD’s breakfast sandwich with a hash brown in the car. Oh the Cozy! 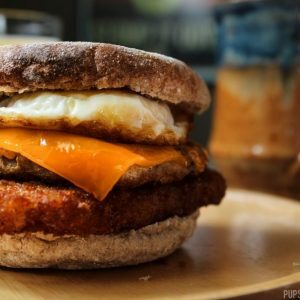 As an adult, I still crave this so I re-created it at home so I can enjoy this anytime and tweaked it to my adult liking (read: messy, runny egg style with the hash brown in the sandwich) so if you’re feeling like a breakfast sandwich too, follow along and lets boogy in the kitchen! All ingredients can be found at your local grocery store. For the meats, I switch it up from time to time. For the hash browns, I put them IN the sandwich. 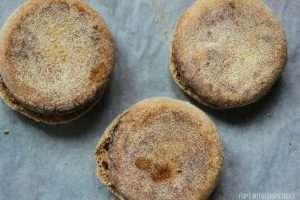 When the english muffins are done baking in the oven, I like to sandwich them back up while I finish cooking the rest of the sandwich. 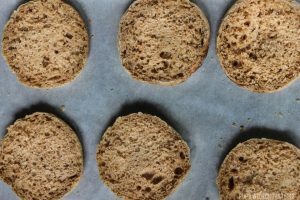 This traps the steam in between the muffins and keeps it soft and warm until you are ready to use them. If you are using the pre-frozen hash browns, set the oil to 375F (190C) and fry them for 1-2 minutes a side. If you are baking them, follow the instructions in the packaging until they are golden and crispy. You can also crispy these up in a frying pan on medium heat with a bit of oil as well. Once the hash browns are done, set them on some paper towel to drain out the excess oil. 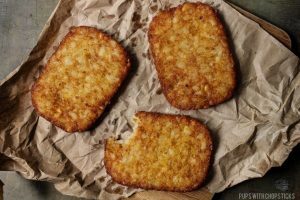 If you choose to make the hash browns from scratch, we have a crispy hash brown recipe “Crispy Hash Browns” you can follow as well. In a pan set the stove to medium heat (medium-low if you are using a cast iron skillet) and cook the eggs for about 3-4 minutes. 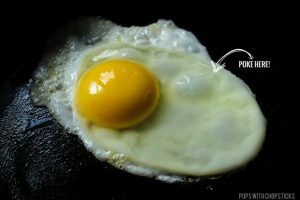 If you like your eggs less runny, flip it over and make it an over easy egg so the yolks cook up a bit and cook it for an extra 40 seconds. In the same pan, cook the sausage, ham or bacon until it is well cooked and browned. If you are adding cheese, turn off the heat and slap the sliced cheese on top of the meat. The residual heat will melt it. Just a heads up to anyone following along every week, I will be MIA next week on vacation. My wonderful friend Jordan & Mom has invited us up to their cottage so I will be mostly disconnected from the wired world but stay tuned, I have a odd feeling I’m going to probably do a recipe post from up there – because – sigh – I have an incredibly hard time disconnecting from the interwebs. Breakfast for dinner is still cool, right? If you are using the frozen hash browns, set the oil to 375F (190C) and fry them for 1-2 minutes a side. If you are baking them, follow the instructions in the packaging until they are golden and crispy. You can also crispy these up in a frying pan on medium heat with a bit of oil as well. This looks like a very hearty breakfast! Wow! Wowzers, this does look tasty! Reminds me of being a kid too! Must be because as a kid, I was made breakfast for…haha now I’m the one making breakfast. Wow this sounds amazing, best breakfast sandwich I’ve seen in a long time! Great idea, I love hash brown, I must try your recipe. 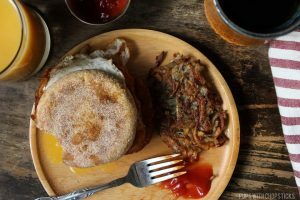 I love the addition of the hash browns in these breakfast sandwiches—one of my favorite hole in the wall breakfast places does this and I must admit, it’s my favorite part of the sandwich! Definitely my favourite part too! I honestly feel like it could just be an egg and hash brown and it would be still amazing. haha! 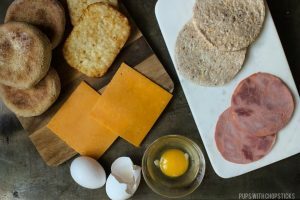 I could eat this for every meal, I’m a closet McDonald’s breakfast sandwich lover from way back! oh those extra 10 minutes are so worth it. I usually hit the snooze button like….20 times a day. haha! 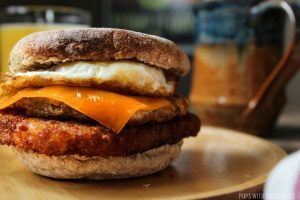 What a new idea to use crispy hash brown potato stack up all-in-one with muffin breakfast like a burger. Thank you Joyce.